In the heat of July, what better way to bird watch than while sitting in your air-conditioned car at an intersection with an overpass that hosts a swallow colony? While waiting for the green light, you can enjoy the birds swooping out to catch insects, and marvel at their maneuverability. How do they manage to raise young? That first flight has to be successful since there are no safe landing spots close by. What kind of swallows are they? Why don’t you see them in the winter? In the Austin area the usual birds nesting under overpasses are Cliff Swallows. Cliff Swallows historically nested on cliffs and overhangs, but have taken advantage of bridges, overpasses and underpasses to expand into areas where they were previously absent. There is evidence from a long-running study in Nebraska that natural selection is favoring birds with slightly shorter wings which gives them an advantage in avoiding traffic. 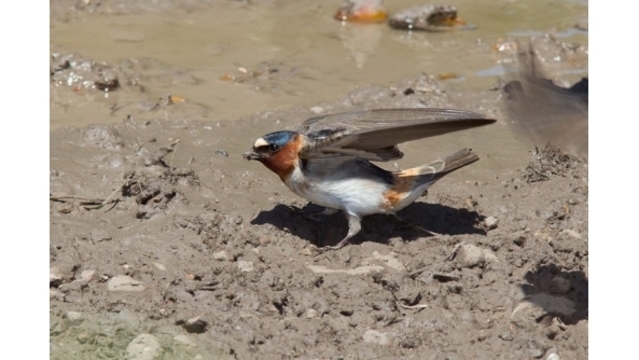 Cliff Swallows need a water source, mud for nest building and open areas where they can forage for flying insects such as wasps, flies, beetles, dragonflies and butterflies. A Cliff Swallow nest is gourd-shaped, about 8 inches long, 6 inches high and 4.5 inches wide. Both the male and female fashion the nest out of mud pellets, each laboriously collected from a nearby lakeside, river bank or mud puddle. It takes about 800 to 1200 pellets to make a nest, which is lined with grasses. Colonies of 200-400 nests are common, but some can be much larger, with the largest colony recorded in Nebraska where 6000 nests were counted. A fun fact about Cliff Swallows is that they sometimes lay eggs in their neighbors’ nests and on occasion will even move an egg from their nest into a neighbor’s. Cave Swallows nest colonially under some bridges and culverts in the area. Some still use caves, in a timeshare arrangement with bats. 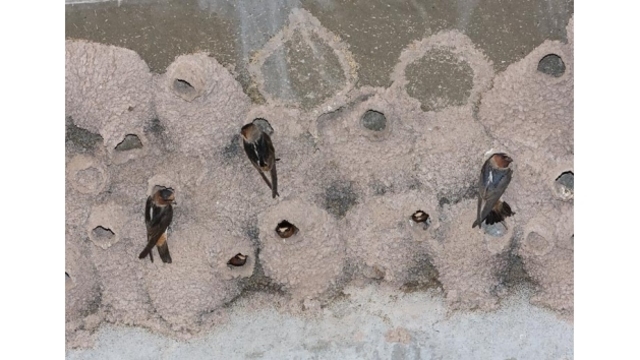 Their nests look different from those of Cliff Swallows, generally with more of a soap-dish shape. 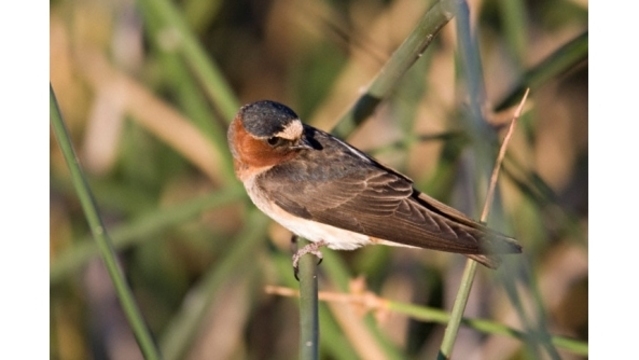 Both Cliff and Cave Swallows can be found in the same flocks. Flying birds are pretty similar in appearance and require patience to identify. Both species are about 5.5 inches long, with square (not forked) tails. Cliff Swallows have dark chestnut throats and buffy rumps, and the adults have white foreheads. 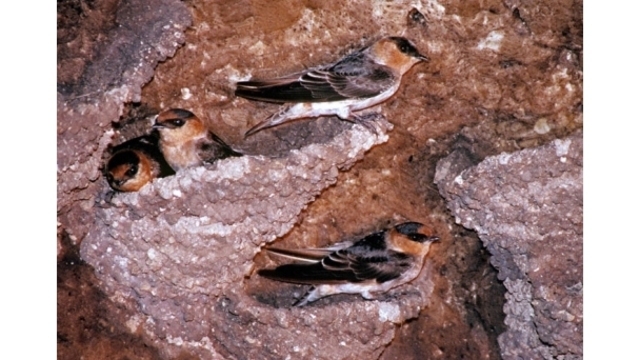 Cave Swallows have paler throats and napes, darker but still buffy rumps, and cinnamon foreheads that contrast with dark caps. This is a lot to see on fast-moving birds. One of the best opportunities to study swallows is at a colony site where you can look at the nest shape, and you can check the color of the birds’ foreheads. Or find a muddy location where the birds are so busy gathering mud that they are a little more tolerant of human presence. Take a photo and study it later. If all else fails, just call them Cliff/Cave or “Clave” Swallows. Cliff Swallows can be found in summer over all the continental US, southern Canada and parts of Alaska; they migrate to South America for the winter. Most of the Cave Swallow population is found in Texas during the summer and they spend the winter in the southern third of Texas down into central Mexico. Travis Audubon July Events — July is hot, but the birds are still out there. Take a class, go on a field trip and experience a Purple Martin Party. Travis Audubon Purple Martin Parties — Grab your lawn chair, check the Travis Audubon website for the location, then hang out with friends and family and watch thousands of North America’s largest swallows come in to roost as the sun goes down. Make it one of your Austin summer traditions. 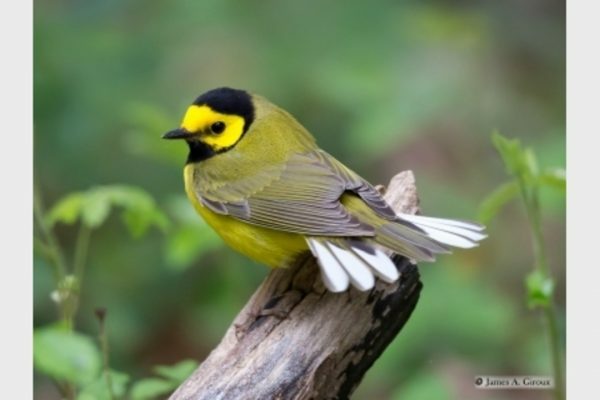 Travis Audubon volunteers have found the roost location and will have members at the site on the weekends of July 20-21, July 27-28, and August 3-4 from 7:45 to 8:45 p.m.
Travis Audubon Field Trips — A great way to learn more about our central Texas birds is to go on a field trip. Check the website for location and registration details. 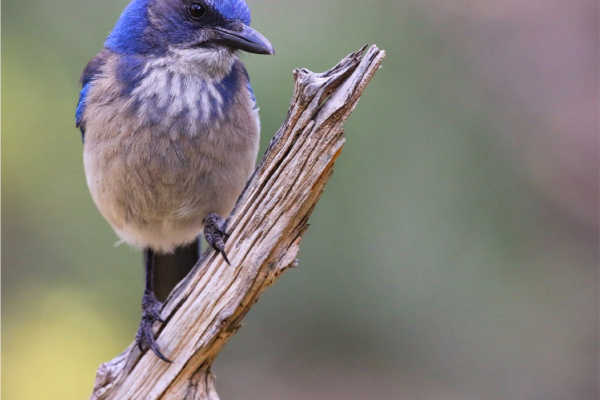 Beginners Bird Walk at Lake Creek Trail in NW Austin July 7, 7:30 to 9:30 a.m. An easy ADA accessible 1.5 mile trail boasts over 200 species of birds recorded. 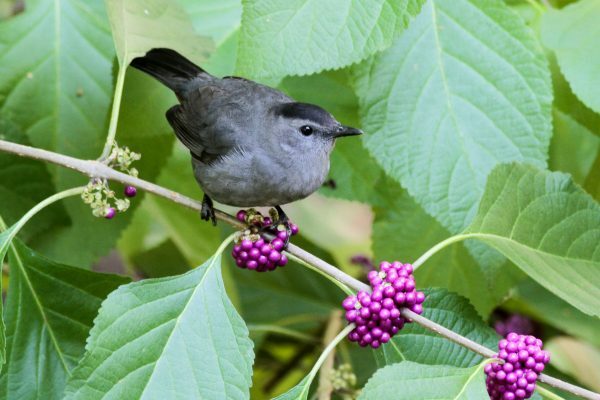 Hornsby Bend Monthly Bird Walk July 21, 7:30 until about 11 a.m. Join us to explore Austin’s premier birding site. This event is sponsored monthly by the Hornsby Bend Bird Observatory. All levels of birders are welcome. Meet in front of the Center for Environmental Research.